Posted on Friday, July 9th, 2010 at 12:00 pm. It’s about that time again for our 2010 Southeast Taiwanese American Association (SETAA) Summer Conference! For the last thirty-two years since its inception in 1978, Taiwanese Americans in the southeastern region of the U.S. have been congregating on either the first or second weekend of July for an annual Summer Conference to celebrate our unique Taiwanese heritage and identity. There is no exception this year! We have since chosen the beautiful campus of Western Carolina University in Cullowhee, NC, as the host location for this year’s gathering. As usual, the conference will kick off in the late afternoon on Friday, July 9th (with registration and opening ceremony), and run through around noon on Sunday, July 11th. As you may recall from your childhood experiences accompanying your parents attending these events, we always use this occasion to, on the one hand, pay homage to our motherland Taiwan, and on the other, to reaffirm our distinctive identity and heritage as a proud Taiwanese American in this ethnically diverse and culturally rich nation. We are able to achieve this by inviting a wide array of highly respected scholars or politicians from Taiwan or here in the U.S. to provide us with some thought-provoking and insightful views and perspectives on the current affairs of Taiwan, as well as Taiwanese American Communities in the U.S. in general. Other than a multitude of older prominent guest speakers we have invited (ranging from former Taiwanese governmental officials, legislators to film historians, directors, or literary critics), this year we are particularly exciting to bring you a young Taiwanese professional, Ho-Chie Tsai, who is going to deliver a timely and pressing keynote topic on the subject of emerging young Taiwanese Americans in the U.S. – A Taiwanese American History in the Making: Generations in Transition. 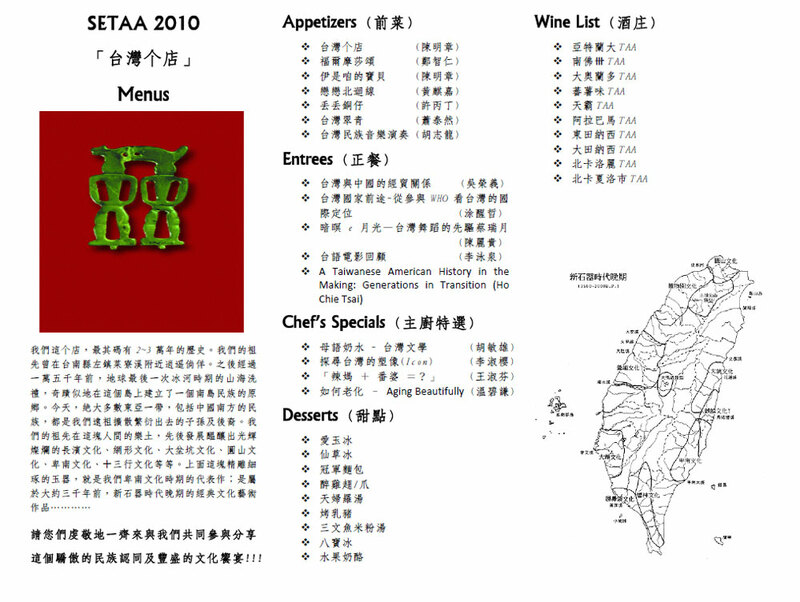 Ho-Chie is the creator of “TaiwaneseAmerican.org” – a website and a newly minted non-profit organization dedicated to connect and highlight the young generations of Taiwanese Americans. He has so far spent most of his youthful life working to build organizations and networks that serve the Asian American community. These days he is best known for his popular “Stinky Tofu Walks Alone” and “I AM Taiwanese American” t-shirt designs. Professionally, Ho-Chie is a board-certified pediatrician on the staff at the Children’s Hospital and Research Center of Oakland, which serves an ethnically diverse and mostly under-privileged population. Please come join us for this, promised-to-be, extremely engaging, intellectual, yet fun event for all ages. Other than all those scholarly and serious discussions on the issues or concerns surrounding today’s Taiwanese American communities, we are also going to pamper you with various delicious traditional Taiwanese snack that you won’t be able to find anywhere else. It is a promise. Please be there to enjoy them!